A group of NASA officials briefed a panel at the National Academy of Sciences last week on Administrator Mike Griffin's revamped exploration plans. The panel being briefed was part of the Academy's Space Studies Board - one organized to review NASA's plans for the International Space Station. Some aspects of the presentations, such as the broad outlines of how NASA wants to go back to the moon, were straightforward. Other presentations - on the International Space Station and what it is now to be used for - the ones that were most relevant to the committee's purview - were far less cogent. This article deals with the overview of the new lunar exploration architecture NASA recently announced - one developed by the ESAS (Exploration Systems Architecture Study). A future article will deal with the ISS issues that were discussed. Such briefings are all rather routine. Whenever a government agency involved in some aspect of science, engineering, technology, or medicine changes its policies, or encounters problems, the Academy is often called upon to review the issue(s) at hand and make recommendations as to how that agency should proceed. Many times, such reviews by the Academy are specifically mandated as part of Congressional legislation. While Mike Griffin sought to immediately truncate the extensive roadmapping actively underway when he arrived, the Academy still needs to review what NASA has produced. After some generalized comments by Scott Pace, John Connolly presented an overview of the new launch systems and spacecraft that will be used to return American astronauts to the Moon. Much of what Connolly presented had been released with the announcement of the results of the Exploration Systems Architecture Study (ESAS). However he added new details previously not presented - and offered briefing charts which went into even greater detail. As with any study, you need to frame some of your options with constraints. NASA loves to talk about "trade space" as the collection of options and alternatives it has available during any particular study. Adding a little structure to that trade space results in a "trade tree". Many times examples are put forth - including images of possible spacecraft which are not final - but meant to illustrate ideas and concepts under consideration. Such things are often called "notional". And of course, until such time as NASA formally releases something in final form, presentations describing a study are referred to as being "predecisional". These caveats aside, what Connolly presented gives a clear idea of what NASA wants to do. 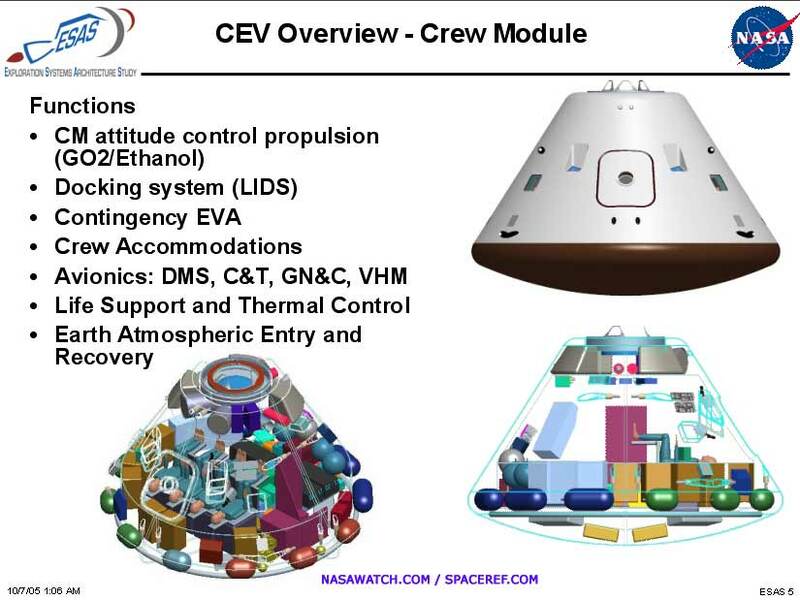 Connolly went into some new detail on the evolution of the Crew Exploration Vehicle (CEV). While the first destination for NASA is a return to the moon, listening to the speakers, Mars is clearly the eventual destination. Indeed, Connolly noted that the sizing of the CEV, its launcher, and the heavy launch vehicle - both developed from modified Space Shuttle hardware - was done to support eventual missions to Mars. Previous studies at NASA have pointed toward the need for a Mars ship of perhaps 200 metric tons - a vehicle assembled in orbit from perhaps two heavy launch vehicle flights. In developing this new architecture, Connolly noted that he and his coworkers ahd become "students of history" (Apollo) and that they had enlisted the advice of space veterans such as Apollo era Deputy NASA Administrator Robert Seamans, former Apollo astronaut John Young, and former flight director Jay Greene. In addition to the heavy launcher, the CEV itself was sized for a role in a Mars mission - with all lunar and earth orbit applications worked backward from those downstream capabilities. The CEV can carry up to 6 crew to the ISS (3 is the normal), 4 crew to the Moon, and 6 as part of a Mars mission. 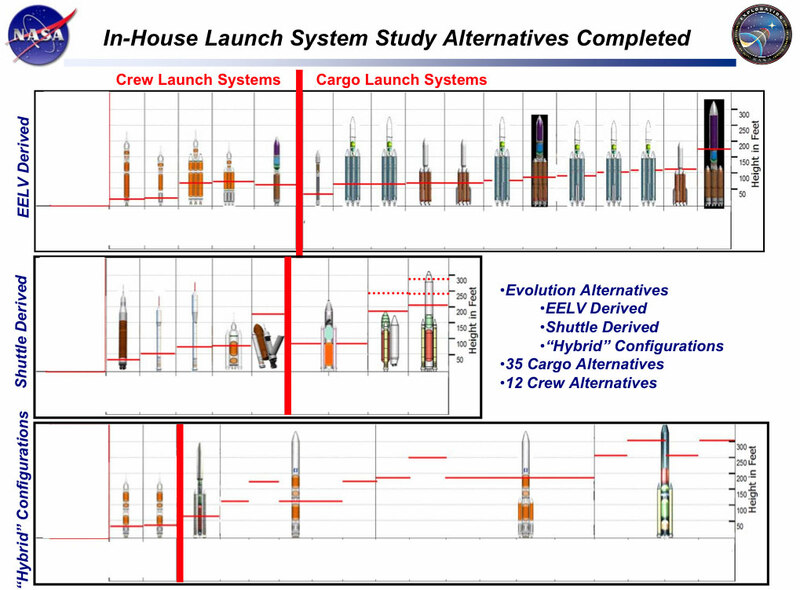 During the year or so following the announcement of what became known as the VSE - the Vision for Space Exploration - by President Bush, a number of studies were conducted [image] which looked at a variety of launch vehicle options. Existing launch vehicles including EELVs and Shuttle derived systems were the most favored. 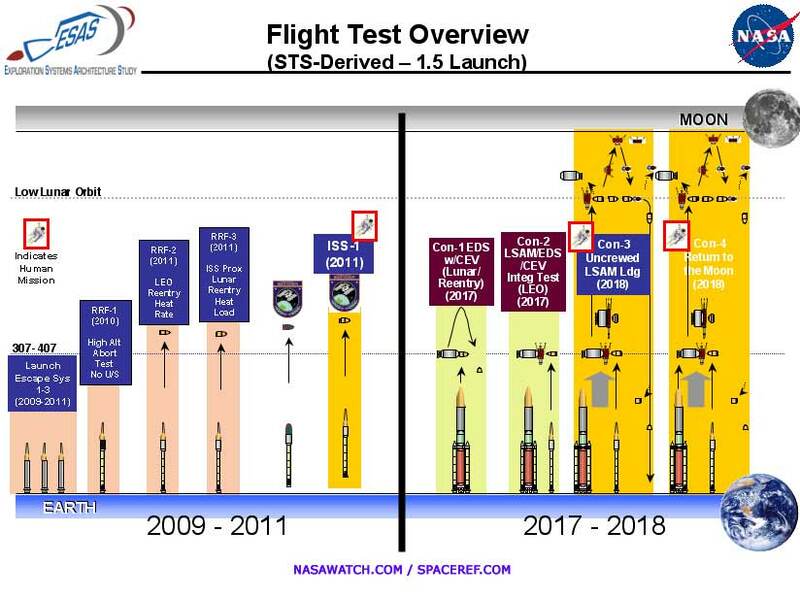 While Shuttle derived systems started to gain an edge over expendable launch systems prior to Mike Griffin's arrival, they quickly pulled ahead when Griffin arrived at NASA. The ESAS came up with two launch vehicles - both of which rely heavily on designs that utilize modified versions of current space shuttle systems. The architecture was designed with the notion of supporting Mars missions in the long term, lunar exploration in the mid term, and ISS support in the near term. Crew size flowed backwards from projected Mars mission needs, and the 6 month on orbit lifetime for the CEV flowed forward from ISS needs. Two launch systems emerged: a CLV - Crew Launch Vehicle - designed to launch the CEV and a heavy lift launch vehicle designed to launch large payloads to the moon and Mars. While the functions of crew transport and cargo transport have been separated - something the Columbia Accident Investigation Board recommended, options exist for putting humans atop the heavy lift launch vehicle and using the CLV to launch unmanned cargos. The CLV will be built using a standard 4 segment Solid Rocket Booster (SRB) currently used by the space shuttle. According to Connolly this is actually one of the safest human launch systems - one with 200 flights (two per shuttle launch) since the Challenger post-accident redesign. The SRB will have a second stage powered by one Space Shuttle Main Engine (SSME) which will be discarded whereas its first stage will be recoverable and reused as has been the case in the shuttle program. Atop the CEV will be a launch escape system modeled after the one used on Apollo. Unlike the current shuttle system where escape modes are not available for all portions of the launch and ascent sequence, there are no "black areas" according to Connolly - the crew can escape from the launch vehicle at any point. While the Shuttle has a 1/200 loss rate (crew and vehicle) on ascent, Connolly said that NASA has calculated the CLV/CEV system as having a 1/2000 loss rate. When asked by an astronaut on the NAS panel where these numbers came from Connolly said that the same probabilistic estimating system that was used for shuttle was used to derive the figure for the CEV/CLV. He also admitted during subsequent questioning by the panel, that this very same probabilistic estimating system gave risk estimates for the shuttle a decade earlier which have now been shown to be off by a factor of 4. The target date for the availability of the CEV/CLV is somewhere between 2011-2012 - a year or two after the targeted retirement of the space shuttle fleet. At an employee briefing to his employees on 6 October 2005, KSC Center Director Jim Kennedy said that the public date for CEV availability is 2012 - but that Mike Griffin was pushing for 2011. Coming online in the middle of the next decade will be the heavy launch vehicle - also based on shuttle derived hardware. 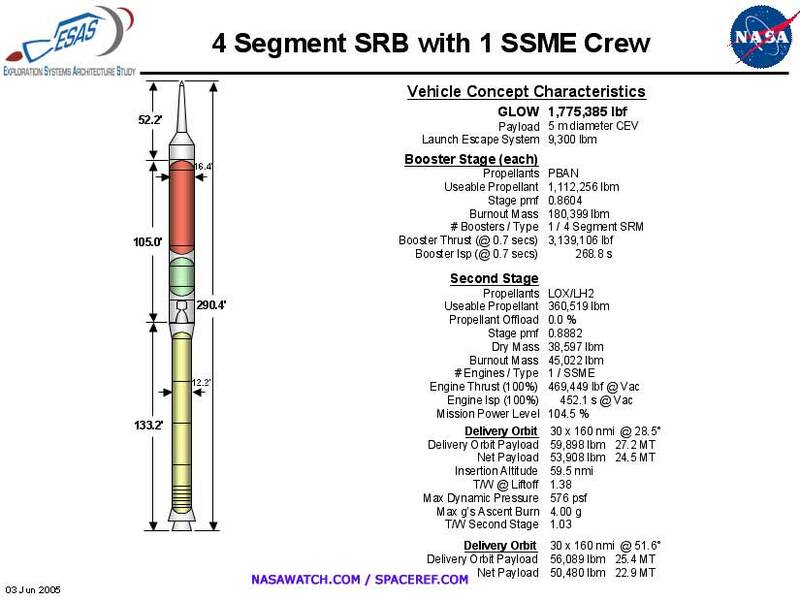 This vehicle will use a modified Shuttle external tank, 5 Block II SSMEs and two 5 segment SRBs. The second stage will two J2S engines - modified versions of Apollo's Saturn V second and third stage engines. This second stage will also function as the Earth Departure Stage - EDS - to place the hardware needed for lunar missions on its way to the moon much as the Apollo program's SIV-B stage did. This monster will be able to place over 120 metric tons of payload into low earth orbit. Again, while this vehicle will be used to support lunar missions, its was sized such that it could loft the several 100,000+ pound elements needed to construct a Mars exploration ship. The CEV NASA wants to build will be shaped just like the Apollo Command Module. The CEV will be a 5.5 meter diameter blunt body with a 32.5 degree side wall slope. Apollo had the same shape but was only 3.9 meters in diameter. The reasons for using the basic Apollo configuration are obvious - not only has it proven itself - but NASA will be able to mine the wealth of testing data that was used to design the Apollo Command Module as well. While the CEV itself is deliberately derived from the general shape and ballistic performance characteristics of the Apollo Command Module, it is totally new under the hood. Think of the old VW beetle and the new one and you get the idea. China's Shenzhou - when compared to Russia's Soyuz is perhaps an even better comparison. WHile the CEV will use aerodynamics data from 40 years ago, it will have the benefit of all the material, computing, and software advances that have been made since that time. While NASA had initially specified that the CEV be reusable - up to 10 times with a disposable heat shield, Connolly said that NASA "hopes" that it will be reusable. The level of reusability that eventually emerges will result from the actual design process itself. Whereas former NASA Exploration head Craig Steidle's approach to CEV development used 'spirals" (a term Mike Griffin has said publicly that he "hopes never to hear again") to denote increasing levels of capability and destinations, Griffin's CEV plan includes different "blocks" of CEVs - each with a different and evolved capability. This is, of course, the term, and the approach used during the Apollo program. The Block 1 CEV consists of 2 vehicles: a crew transfer version for ISS use (Block 1a) which could carry 3 ISS crew and 400 kg of cargo. 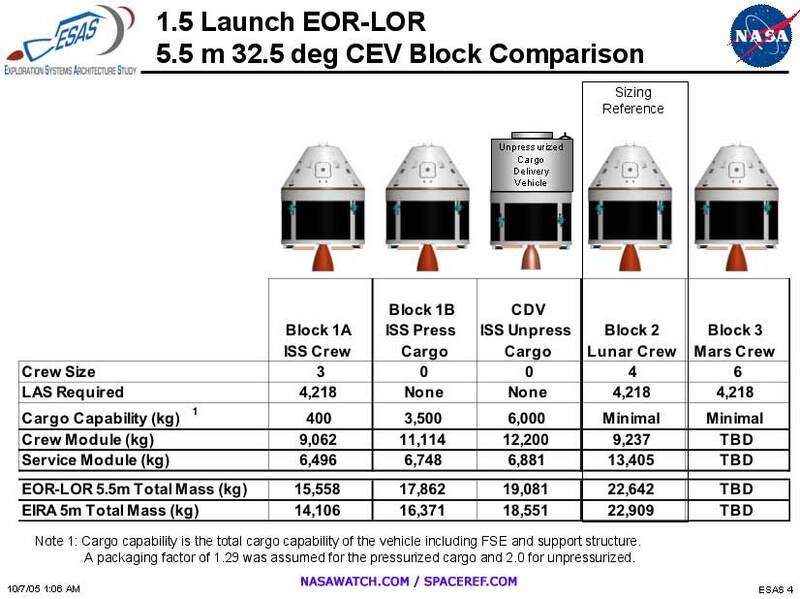 An unmanned (but pressurized) variant for cargo (Block 1b) could transfer up to 3,500 kg to the ISS. A Block 2 CEV variant would be created to carry 4 humans on lunar missions. A Block 2 CEV variant (service Module but no Command Module) could also be used to deliver up to 6,000 kg of unpressurized cargo to the ISS. A Block 3 CEV would be used to perform Mars missions with a crew of 6. It is likely that This vehicle would be used at the beginning and the end of the mission for crew transport and serve other purposes during the trip to and from Mars. Of course, the Mars architecture itself has yet to be specified, so the CEV role is not 100% certain at this point. However, as this plan is being worked out, it is likely that many structures and systems (propulsion) to be used in Block 1 and 2 CEV vehicles will be used around - and on - Mars. In designing the CEV, Connolly spoke of a focus on improving upon the way things had been done in the 1960s. Preparing the spacecraft for launch involves the loading of propellant for reaction control (RCS) thrusters. Apollo used monomethyl hydrazine and Nitrogen tetroxide - both nasty substances. The CEV will use far more benign fuels - oxygen and ethanol thus making ground preparations - and post flight servicing less hazardous. The CEV will have a docking system compatible with the ISS and with all other elements of lunar and eventually martian spacecraft. It will also be able to support contigency EVAs. The CEV's Service Module will supply the same overall capabilities as did Apollo's. Given the need for in-space service life of up to 6 months, the CEVs Service Module will need to be far more reliable - and long-lived than Apollo's. Apollo used fuel cells to generate electricity. For the periods the CEV will be in space, fuel cells are not the optimum choice - so solar arrays will be used instead - the first time an American manned transport spacecraft has done so. The two arrays will deploy from the aft end of the Service Module and will generate 4.5 kW each. The ECLSS/ATCS (Environmental Closed Life Support System/Active Thermal Control System) will utilize a 60% propylene glycol/40% water single phase fluid loop which will be run through four 7 m2 body-mounted radiators. The propulsion system will utilize one 15,000 foot pound pressure-fed liquid oxygen/methane engine with an Isp of 362 seconds. The Service Module will have 24 100 lbf RCS engines - each with an Isp of 315 seconds. The fuel tanks will be AL-Li graphite wrapped, rated at 325 psia and will use gaseous Helium pressurization. The Service Module itself will feature a stringer/ring frame construction with graphite epoxy composite skin. The CEV will make its way back to Earth as did Apollo but it will touch down using airbags, braking rockets or some other system - and will do so on dry land. The landing site may be Edwards Air Force Base - or some other location on the U.S. west coast. West coast landings are needed so that the Service Module, which also returns to Earth (via destructive reentry) lands in the Pacific Ocean - and not the continental U.S. In addition to avoiding the need of an ocean going recovery force, dry land recovery avoids exposing the CEV to salt water - exposure which can complicate NASA's hope that the CEV will be reusable. One of the key differences is the lunar lander - the Lunar Surface Access Module (LSAM) - and its capabilities. It will carry 4 astronauts to the lunar surface and can stay there for a week. Connolly spoke of a baseline plan for two missions a year. The initial model - the one NASA is working toward right now is sortie driven - i.e. trips to and fro - but no long term stays. It is clear, however, that NASA is thinking about permanent bases as a logical outgrowth of a sortie-driven initial phase of lunar exploration. 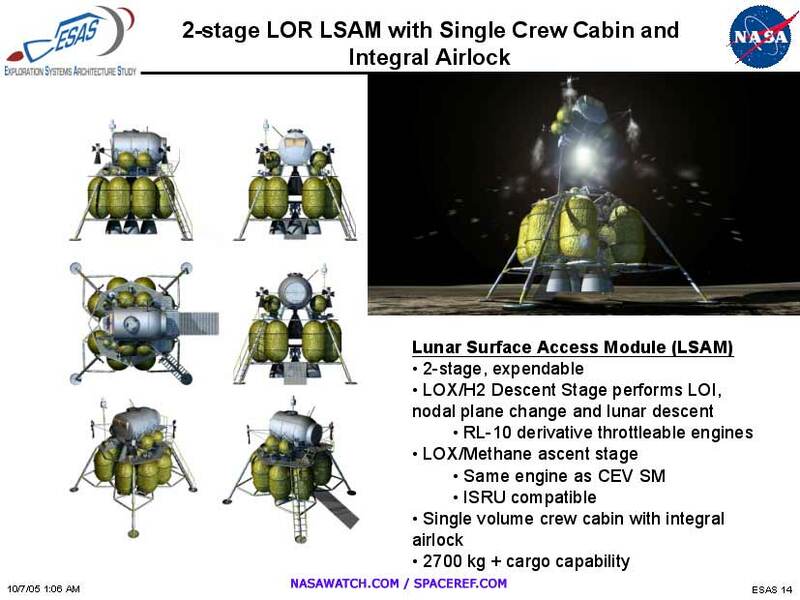 The LSAM will be a two stage, expendable spacecraft with a general look and feel similar to the Apollo Lunar Module. 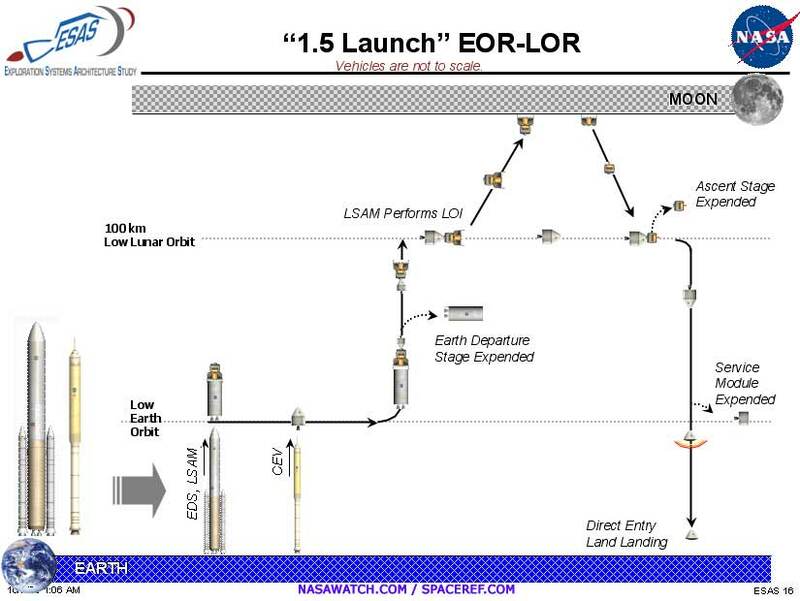 The descent stage will use a liquid hydrogen/liquid oxygen fueled RL-10 derivative engine which can be throttled. This engine will be used to perform lunar orbit insertion, nodal plane change, and lunar descent. The engine will be capable of 1100 m/sec Delta V for lunar orbit insertion and 1850 m/sec for lunar descent. 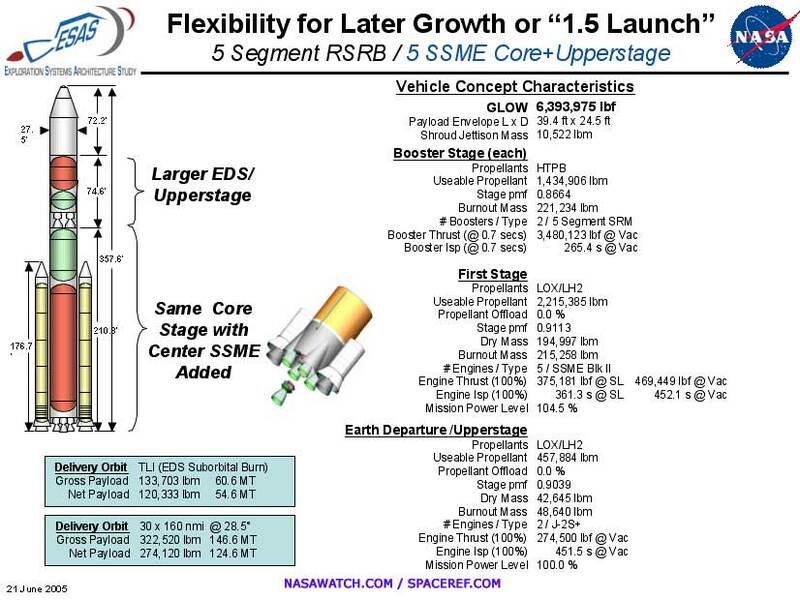 The ascent stage will use the same engine as the CEV Service Module. It will be pressure fed, and will be fueled by liquid oxygen and methane. The choice of these fuels has a long range rationale: ISRU - in situ resource utilization. In the case of lunar missions, it its possible that lunar water ice deposits could be mined, and the oxygen used as to fuel LSAM return missions and perhaps life support systems as well. If this engine is used on Mars, then it is possible that both the oxygen and methane could be produced from the Martian atmosphere. Including such systems in lunar vehicles will afford NASA a chance to test out the technology close to Earth before it is deployed on Mars missions. 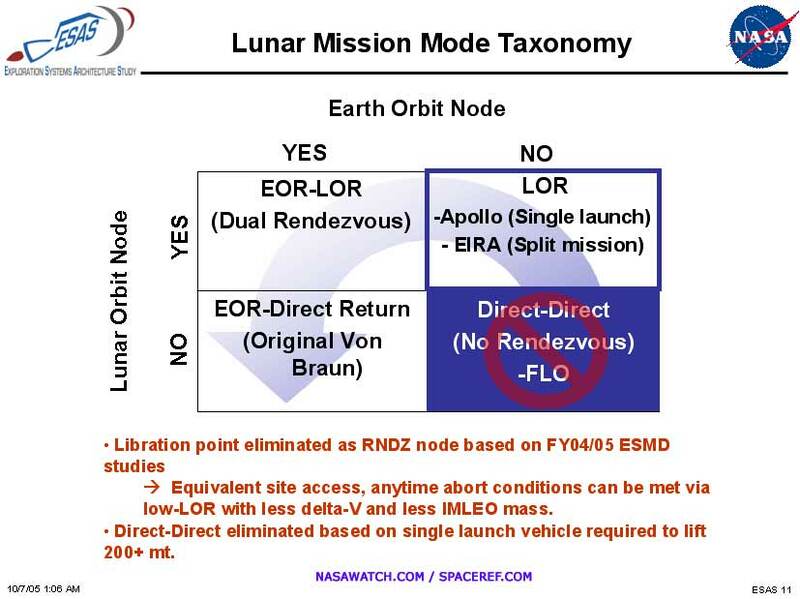 The LSAM will also have access to a much wider range of landing sites than did Apollo missions. While Apollo was limited to landing on the equatorial region on the near side of the moon, the LSAM can land anywhere on the moon - including the poles and its farside. It will also be designed to depart the moon on very short notice and, once the crew has docked with the CEV waiting in orbit, to return to Earth. NASA refers to these capabilities as "Global Lunar Access" and "Anytime Return". The phrase "Anytime return" can be traced back to the Apollo era when it was used in documents describing various contingency scenarios. There is still a lot of un-assigned capacity aboard the LSAM. Just over 2,200 kg has yet to be spoken for. This payload margin could be used for science gear - or perhaps the beginnings of a permanent base. In addition, It is also possible that an unmanned variant of the lunar lander could be sent to the Moon with supplies and equipment. If the ascent stage is left off, Connolly said that up to 21 metric tons could be landed on the lunar surface. If you look back at some of the plans NASA had for advanced Apollo missions, you will see that similar thinking was followed back then. Alas, Apollo was ended just as it was about to pass the threshold between quick sorties and true lunar expeditions. This lunar lander will be a bit more cozy than its cramped, spartan Apollo predecessor. At Mike Griffin's insistence, there will be an airlock which allows dirty spacesuits and other items to be kept separate from the crew's quarters. Connolly noted that thought is also being given to leaving part of the crew compartment behind as part of a cached resource that could later be used for a lunar base. Such an approach is currently referred to by NASA as an "Incremental Build Approach". Connolly said that the current plan is to start off with two lunar missions per year. That frequency was derived in part from the capabilities that were assigned to the CEV i.e. the ability to function in space for up to 6 months and the launch rate that would likely be used to support the ISS. "There is nothing magic about 6 months" Connolly said. However the 6 month lifetime needed for CEVs that visit and stay at the ISS "backed its way into lunar missions." Sorties would not depend on any pre-deployed assets and would be able to land at any location on the moon. The crew of 4 would use the LSAM as their base of operations for up to 7 days. EVAs on the lunar surface wold be conducted every day utilizing all crew members. The crew could either act as one large team or as two separate teams simultaneously. To get around the lunar surface two rovers would be brought with the LSAM to allow separate, simultaneous sorties on the lunar surface. The rovers would allow the crew to go 15-20 km from the landing site. Sorties missions would focus on three activities: lunar science (geology, geophysics, astronomy, Earth observations,and astrobiology); resource identification and utilization (lunar water); and "Mars-forward technology": demonstrations including autonomous operations, partial gravity systems, advanced spacesuits, and overall operations. While no formal plans for a lunar base have been baselined by NASA as part of the ESAS, Connolly did speak of a general concept that everyone has been working toward- a base located at the Moon's south pole where possible water ice deposits and plentiful solar energy are possible resources that could be tapped. The advantages of the lunar south pole have to do with resources that are known - or expected - to be located there. Elevated amounts of hydrogen detected at the south pole in locations such as Shakleton crater may be indicative of water ice which can be used for life support and fuel production. Due to the location on the moon's surface, the poles offer long periods of extended solar illumination which are not available over most of the lunar surface. Depending on the exact location and the local topography, illumination can range from 80% with the longest period of darkness being 50 hours to 70% illumination with longest dark periods ranging from 140-188 hours. There are some disadvantages - the terrain is undulating, the shadowed regions inside the craters can reach -223C, the sun is low in the sky casting long shadows, and there is no constant line of sight communications with earth. All of these factors would need to be factored into how the base was constructed and operated. Before serious planning can commence, additional data will be needed. NASA is looking to its Robotic Lunar Exploration Program (RLEP) to answer the open issues that remain with regard to placing a base at the south pole of the Moon. Assuming that the South Pole is characterized to the extent needed to answer lingering questions, NASA is looking to implement the development of a lunar outpost in a sequential fashion. According to Connolly, development of a lunar outpost is "an extension of sortie missions"
According to a presentation Connolly provided to the panel, the first items to be landed would be a power system and the essential backbone of a communications and navigation system. This would be followed on subsequent flights by landing habitat modules, logistics, and ISRU (in situ resource utilization) hardware. Once landed, these items would be assembled and plugged into the power and communication/navigation systems that were landed on the first flight. These operations would likely be done with automated or teleoperated systems. The next step wold be for an un-crewed, LSAM - with a fueled ascent stage - to be landed at the nascent base prior to the first crew's arrival. This is a safety and operational redundancy provision that would allow for the presence of two, fueled ascent stages during crew rotations at the base. In planning this outpost, NASA has been incorporating a number of design principles. First, once things have been landed, they should not need to be moved on the surface unless absolutely necessary. Landing things at the outpost needs to be done with a common cargo descent stage. Autonomous activities such as walking around and interacting with payloads, should only be performed if absolutely necessary. When the crew is required to deploy elements of the outpost, the tasks should be limited and simple. Common functions such as power distribution, should be performed in a common, uniform fashion. When logistics are delivered, minimal crew time - and robotic manipulation - should be required. According to Connolly , much of what is featured in this new architecture clearly reflects NASA's interest in building up to the capability of mounting human missions to Mars. The large heavy lift shuttle derived booster, the 6 person CEV, ISRU fueled vehicles are examples of deliberate Mars mission sizing. However focused things are on a Mars endpoint, Connolly said that no specific Mars mission architecture was developed as part of the ESAS. According to a presentation Connolly provided to the panel, with regard to the mission architecture, this trade tree included: Deep space staging locations (places where docking and assembly could occur) - use none, Lagrange points, low lunar orbit (LLO), and the lunar surface. Earth-orbital staging points included using none, low Earth orbit (LEO), the ISS, and high Earth orbit (HEO). As far as lunar landing options, equatorial only, polar, mid-latitude, and far side were options. And as far as abort or contingency strategies to be considered, an "anytime return" with orbital loitering and surface loitering (i.e. being able to wait a certain period of time before returning to Earth) were available as options. Equal in weight to the mission architecture was the surface architecture i.e. what would be done after arrival on the lunar surface. How you get there and what you do once you get there need to be well coordinated such that one aspect does not unduly drive the other. The questions asked were "what is the content of the science, resource utilization, and Mars-forward technology demonstrations and operational tests? Where are the highest priority sites? and DO he scope of activities require a permanent outpost, and if so, how is it configured and how is it deployed? A variety of options were developed- many very reminiscent of Apollo's early trade studies. Direct ascent and landing i.e. using one launch - with no docking to send a ship to them moon and then back again was ruled out due to the enormous size of the vehicle required - and the immense booster needed to loft it. Launching everything on a Saturn-V class vehicle ala Apollo was also eliminated. Although some studies looked at putting humans on a heavy lift launcher, the development of a CEV-specific launcher kept the lunar payloads on two launch vehicles. What resulted was a 'dual rendezvous" model which requires two launches - CEV and LSAM/EDS which link up in Earth orbit. After that, the old Apollo plan takes over. Some earlier NASA studies had spoke of using Lagrange points in the Earth-Moon system as possible staging/docking points. That option was eliminated based on ESMD studies done in FY 2004 and 2005. More Than Just Flags and Footprints? The issue of what drives what NASA wants to do on the moon and elsewhere as part of the VSE. Mike Griffin, of course, responds simplistically by saying something along the lines of "the President said so". While, of course, that is quite true, John Connolly did present three overriding reasons for going back to the moon: science that can be done there; learning how to extract local resources and use them; and using the moon to test operations, procedures, and technology so as to better equip missions to Mars. When people are critical of the ESAS architecture, they don't get into the specifics - but rather point to a lack of clear scientific reasons why humans should be going back to the moon. Going there for the sake of going (back) there (again) - regardless of who said so - is not enough for many people - especially when war and hurricane costs compete for scarce budget resources. According to Connolly, when the final ESAS report is issued it will have "a large section on what we will do on the moon. We realized that we can't just focus on transportation." This architecture has been out in the public view for a month or so. The media has already had its way with its initial presentation. Congress will soon weigh in on whether they think it is the right thing to do, whether it is supportable, and whether they will sign on to support it. There is some valid skepticism on the financial aspects of how Mike Griffin wants to pull this off. However, based on the technical aspects of the architecture itself, while it is more bare bones than many would have liked to see, it is a frugal, well thought out way to pick up where Apollo left off - and then move ahead with the personal exploration of the world closest to our own. Hopefully, if NASA is able to pull it off, it will both restore the confidence in NASA's ability to mount large space projects and hopefully whet the appetite of a new generation for the personal exploration of planets beyond - i.e. Mars. If you want to read a book that delves into the potential of bases at the lunar poles, have a look at "Moonrush" by Dennis Wingo. If you would like to take a nostalgic trip back to what many people thought might have happened if the pace of Apollo was maintained - and expanded, getting a copy of "Where The Winds Sleep - Man's Future on the Moon: a Projected History" written in 1969 by Neil Ruzic is worth the effort. Then of course, there is my favorite fictional post-Apollo, Shuttle-derived lunar architecture as portrayed in Homer Hickam's "Back to the Moon". And of course, "New Moon Rising: The Making of America's New Space Vision and the Remaking of NASA", the book Frank Sietzen and I wrote which outlines the initial formulation of the Vision for Space Exploration.